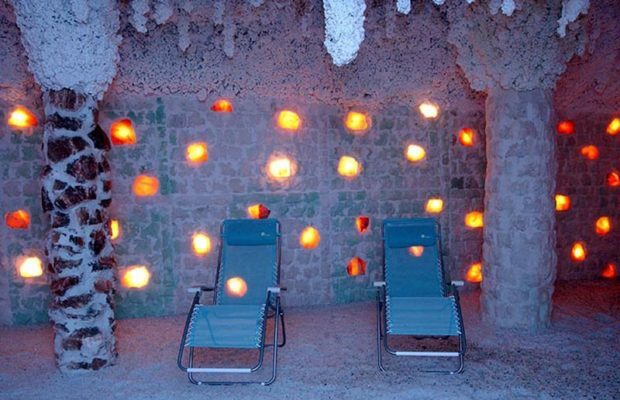 Our salt cave offers you a relaxing rest in its healing atmosphere charged with negative ions. The combination of serene music, the sea air, and colored lights amid glittering salt crystals from the Dead Sea, the Black Sea, Pakistan, and Polish Klodawa will do wonders for your body and soul. The Birdie salt cave offers you a session of halotherapy and music therapy for just CZK 170. The cave, covering an area of 70 square metres, was created using 40 tons of salt. It is equipped with 17 adjustable French beds, inhalation fountains, and salt-falls. Just 45 minutes, which is the time of one session, has the same beneficial effect as 2-3 days spent at the seaside. boosting immunity and slowing the ageing process, and energy replenishment. Salt is more precious than gold, and we are ready to provide you with the conditions you need to relax and restore your vitality for the next day. The unusual place and atmosphere will restore your health, vitality, and mental and bodily condition. Opening hours: Wed – 11:00 AM – 7:00 PM. !! Closed during July, August and September !! If you are interested in a later visit to the salt cave, this can be arranged. Our salt cave is an oasis of quiet, rest, regeneration, and relaxation. The procedure always starts on the hour and lasts for exactly 45 minutes (it is always suitable and necessary to come 5-10 minutes before you plan to enter). Late entries to the salt cave are not possible. Cubicles are available for ladies and gentlemen to change or put on their swimsuits. For guests in a swimsuit, it is possible to pre-arrange with the receptionist to have the temperature raised to 25°C. In this case, you will be provided with a gray bed sheet. We recommend wearing airy and loose clothing, preferably made of natural materials; entering barefoot or in socks or shoes is forbidden. The disposable plastic shoe covers provided must be put over your footwear. As part of the comprehensive care, you will be offered a menu in reception. We can arrange for your favorite dish to be ready for you in the restaurant after your salt cave session is over. Mobile phones, food and drinks are not allowed in the salt cave. We also recommend not applying any cosmetics, especially perfumes and body deodorants, before entering the salt cave. When you enter the salt cave, lie down comfortably on one of adjustable beds. Relax and let the relaxing music, light, and the cave microclimate affect you. We recommend deep abdominal breathing in turns through the nose and mouth. Watch your hands for the floor salt – do not touch your eyes. During your visit, keep quiet and do not disturb other guests by talking loudly. It is forbidden to take pictures or film in the cave interior without the operator’s consent. It is forbidden to touch the salt walls and ceiling, interior fittings, or to remove crystalline salt. Especially parents are asked to supervise their children carefully. Children under fifteen are only allowed to enter the cave attended by an adult who is responsible for adhering to the visiting rules. Toys are available for pre-school children. Turning off the relaxing music and turning on the illumination lights is the signal that the salt cave session is over. The attendant also opens the door for you to leave the cave. We would like to point out that an industrial camera monitors the inner area of the cave to ensure safety and security. If you feel any sudden discomfort, you must leave the cave immediately. We recommend taking advantage of the monthly cut-price permanent passes for multiple entries. We do not recommend the cave for people suffering from claustrophobia and infectious diseases. Quiet music, a gurgling waterfall, the magic light of salt lamps and their reflection on the stalactites of the colorfully glimmering firmament, and, best of all, the quietness of a the curative relaxation stay in this atmosphere charged with anions; all this is on offer in the salt cave. It has long been proved that the mental and physical condition of people suffering from stress, depression, allergies and some breathing problems, hypertension or psoriasis, and other dermal disorders, significantly improves in salt caves. However, deep genuine salt caves allowing one to rest on comfortable relaxation beds are relatively scarce in the world (due to the number of civilization deceases that affect mankind). It has been proved that specialists can, working with doctors, closely simulate the salt cave environment. 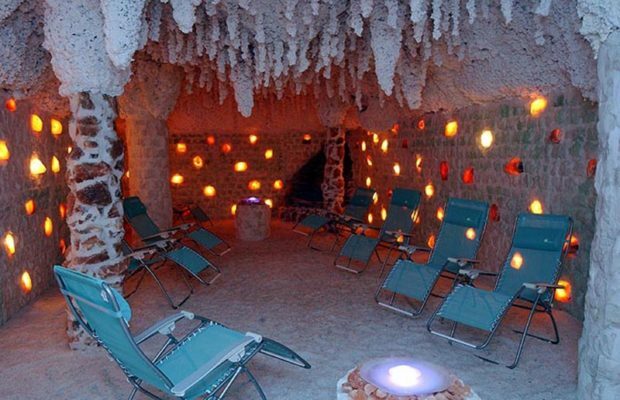 In Europe, especially in Poland, Slovakia, and elsewhere, many of these man-made salt caves are available for ill and tired people Specialized companies have created them primarily in spa sanitariums and tourist destinations. 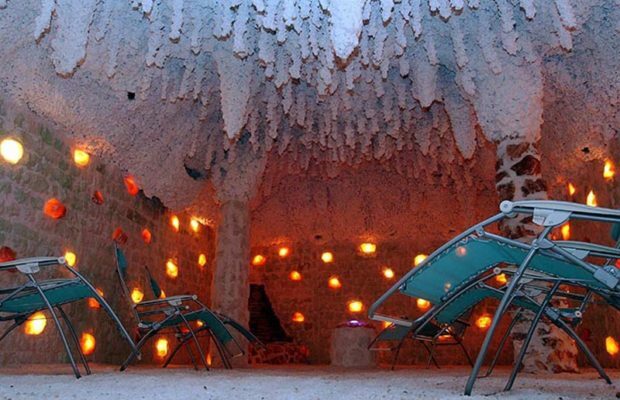 Salt caves are becoming more and more an integral part of hotels and boarding houses. One of the first salt caves in our region is now available also in our city of Pardubice at the Birdie boardinghouse on the throughway close to the station. We would also like to look after you by offering you a menu when you enter the salt cave reception area. We can arrange for your favorite dish to be ready for you in the restaurant after your rest in the salt cave is over. Right in the centre of Pardubice you can find, in addition to accommodation and great food, a magical place that will boost your health and let you forget the stressful anxieties of modern life, at least for a while. The combination of wild nature, the sea air, and colored lights amid the glittering salt crystals of the Dead Sea, the Black Sea, Pakistan, and Polish Klodawa will do wonders for your body and soul. The Birdie salt cave offers 45 minutes under dimmed lights and with relaxing music for just CZK 170. The séance of halotherapy, musictherapy and aromatherapy sessions always start on the hour. The cave is equipped with 17 adjustable French beds, inhalation fountains, and salt-falls. Polish experts created the 70-square-metre cave using 40 tons of salt. All the surface of the walls glitter glowing orange and red salt lamps imported from Pakistan. Salt stalactites densely cover the cave’s vaulted ceiling. These are illuminated by thousands of tiny LED sparklers which continuously change color. Salt crystals from the Dead Sea and the Black Sea even lie on the cave floor. One session takes one hour, including the preliminary and final procedures. On the bed, you can relax for 45 minutes, meditate, listen to music, breath deeply and sleep. For your visit to the cave, we recommend light and airy clothes made of natural fiber. As the ions in the cave pass through the whole body, including clothes, clients may wear long trousers and long sleeves. If needed, the temperature in the cave can be increased so it is pleasant for clients wearing swimwear too. Special feet covers must be worn in the cave. Absolute quiet is recommended. As children are also allowed to visit the cave, it is assumed they are supervised by their parents. A visit to the cave is not recommended for people suffering from claustrophobia. It is forbidden to enter the cave with any infectious or acute decease, flu, acute cough, and other forms of common cold illnesses, and especially with tuberculosis. Persons with increased thyroid activity, oncology disorders, and with kidney diseases are recommended to consult their doctor before first entering the salt cave. What are the effects of the salt cave on the human body? The salt cave specifically utilizes the curative action of salt; it creates a unique inimitable microclimate distinguished by its high bacteriological purity, sufficient humidity, and a pleasant temperature. Heavily saturated with micro and macro elements, negatively ionized air is the salt cave’s specialty. Salt therapy was known as far back as in ancient Greece. Halos is the Greek word for salt. Therefore, halotherapy is the method of inhaling salt diffused into the air. However, the air is also over-saturated with sodium, iodide, calcium, magnesium, and bromine compounds, and also compounds of other elements crucial for the human body to function correctly. This property of the cave climate has beneficial effects on energy, stamina, and mood. 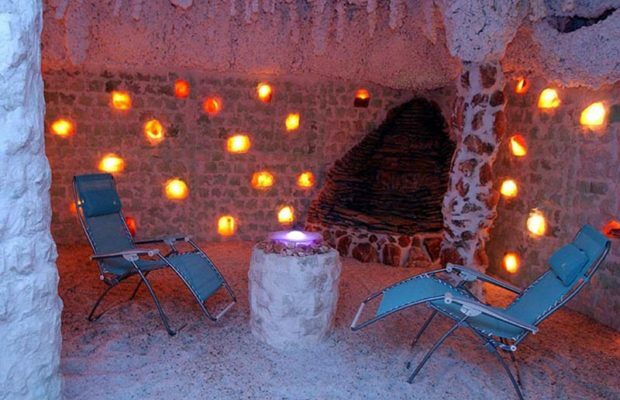 Besides the other advantages, a stay in the salt cave is as healthy as spending 2-3 days at the seaside. The cave microclimate can be compared with the atmosphere of the sea during and after a strong thunderstorm. If we combine all this with the light, music, and aromas, one’s health can be individually improved in just one or several procedures. The halo, music, and color therapies have a positive effect on the human psyche. The unusual place and atmosphere will restore your health, vitality, and mental and bodily condition. The mineral substances contained in the Dead Sea salts have a very positive effect on the health of the skin and clean it, and, applied through regular visits to the salt cave, they will boost the strength and elasticity of the skin and improve its blood circulation. In addition to cleaning the skin, a stay in the cave has curative effects, supports the skin’s ability to eliminate toxins, and helps flatten puckers and cure cellulitis, thus slowing down the ageing process. boosting immunity and slowing the ageing process. Renowned research institutes have also confirmed the positive effects of salts; the microclimate of salt caves is patent-protected and has been confirmed by the world’s renowned certification authorities. Salt is not just a mineral used for cooking. The fact that “salt is more precious thangold” can be understood if we consider the chemical composition of sea water, which is, regarding its salt content, very similar to the environment the human fetus and placenta develop in. Approximately 0.9% of human blood comprises sodium chloride. Procedures provided in the salt cave are recommended not only to people with health problems, but also to healthy individuals, primarily sportsmen and women who need to replenish their minerals in order to maintain a high level of physical and mental condition. Bromine – has beneficial effects on the nervous system and reduces blood pressure. How often should one visit the salt cave? In the case of medical indications, it is generally recommended to visit the cave at least ten times within as short a period as possible. The best way is to visit every other day. When the acute problems have disappeared, it is suitable to keep visiting at least once a week, later on once a month. Healthy people may visit the salt cave for prevention or rest, and relax for as long as they want or are able to. Unfortunately, no health insurance company pays for the use of a salt cave; however, this possibility is currently being discussed. All are welcome to visit the salt cave, old and young, parents with children, and groups of friends. Come and try the curative and relaxing magic of salt on the seventeen comfortable beds in our salt cave. Salt is more precious than gold, and we are ready to provide you with the conditions you need to relax and restore your vitality for the next day. By completing the on-line booking form you can easily book a place in our pension.